If you’re heading to the in-laws or spending time with family and friends, whose food choices are different to those you’d prefer, you’ll need a few key strategies to help you secretly stay on track without being a health bore! After all, it’s Christmas and your healthy eating message is likely to fall on merry deaf ears! It’s hard enough to make the right choices at the best of times, but even harder when you’re not in control of what’s on offer. Here are 6 strategies you can put in place over the festive period to help you stay on track. But first…..start by working backwards…in other words, have an end result in mind. How do you want to feel in the New Year? Do you want to look great, feel slimmer and generally more confident about yourself? Aligning these wishes with the foods you choose over the festive period will go a long way to helping you stay on track where possible. One of the biggest pitfalls is the idea of saving yourself for the big meal, whether that’s a big family lunch banquet or a dinner out with friends or family. Keeping your blood sugars balanced throughout the day is key. Skipping a meal will result in very low blood sugars and you’ll then arrive at a meal ravenous, jittery, light headed and perhaps even a little anxious. These are all signs of low blood sugar and are messages for you to EAT, EAT, EAT and in particular sugar. You are much more likely to over-indulge if you arrive at meal in this state. Stick to eating 3 balanced meals during the day and savour and enjoy the big meal without overeating. To enjoy the festivities with full energy and vitality, you’ll need to stay hydrated, so drink plenty of water. Drinking water not only helps you to feel energized but also helps to flush out toxins, which would otherwise leave you feeling drained and lethargic. Make a point to have a glass of water in between each alcoholic drink when you’re out socializing. If you spending the day with family and friends, keep a herbal tea on the go wherever you can. This will not only distract you from snacking, but will help you to avoid alcoholic drinks for a little longer. Have a rule not to drink alcohol before a certain time and only during a meal; on normal days this may not be a problem but in the midst of the festive celebrations, alcohol tends to flow at the most unusual times! This is especially hard when there are so many sweet treats on offer over the festive period. However, understanding that eating foods and drinks that are high in sugar encourages cravings will help you to be much more selective as to when you will opt to indulge in an that enticing sweet offering. 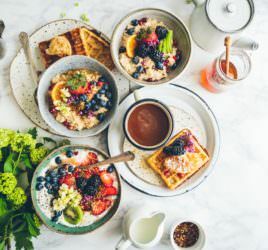 Keeping your blood sugars balanced is key, so opt for low glycaemic foods, in other words, foods that release sugars into the blood stream slowly, so that you can avoid the blood sugar surges and the inevitable dips (and consequent cravings) that follow. Choose a combination of good lean proteins, healthy fats and plenty of vegetables and fruits. If you’re heading to a bar or party, then make sure you’ve eaten a meal before you go out. As you are full and satiated prior to the evening’s activities, you are less likely to indulge in unhealthy party food or snacks that are on offer. If you’re going out for a meal, perhaps have a light snack; for example a small salad or a piece of fruit with a small handful of nuts. This way, you will not be ravenous and are more likely to make healthier choices when scanning the menu. Are you really hungry and do you really want to eat the food that is on offer on the buffet or canapé trays? You may find that you are eating simply because it is presented in front of you but in reality, the choices are not your favourites or you’re not actually that hungry? If you are tempted and are genuinely hungry, then make a decision how many canapés you will try and stick to it. One approach is to only accept every other offering as the canapé trays make their rounds. Opt for the vegetables and protein-based choices first, rather than the fried or pastry option, as these will take the edge of your appetite and avoid unnecessary calories. By the time the dessert trays come round, a “mind over matter” approach will help you to politely refuse the tempting sweets. Try to take the attention away from food and meals by encouraging some exercise or any other activity over the festive period. It’s not always easy to muster the family or friends away from the sofa and warmth, but you’ll be surprised how much fun it can be if you do manage a brisk walk or a wander around a museum. Adopt the 80:20 rule; keep this in mind as far as possible, where you make good choices around 80% of the time, allowing you to make less healthy choices for 20% of the time.